My husband gave me a gorgeous bouquet of roses for our second anniversary, sweet pink and white, surrounded by, I swear, an entire field of baby's breath. I thought, what a useless little flower, no smell, the blooms are tiny, the stems are weenie. What is the point? 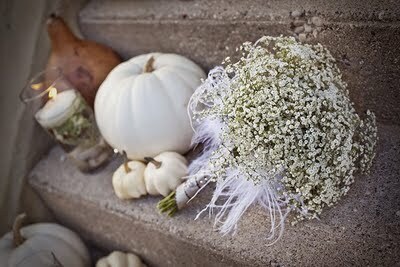 Yet baby's breath weddings are all the rage these days - rustic, backyard, barn, practical, and vintage weddings are all bursting with this dainty, understated flower. 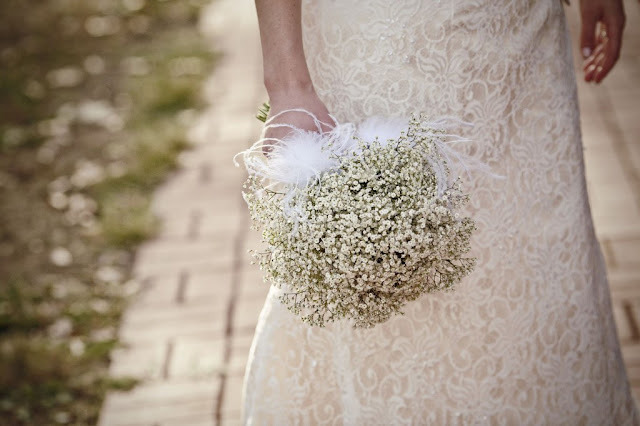 There is something elegant and rustic, romantic and simple about a baby's breath bouquet or centerpiece; it isn't pretentious, over the top, or demanding of anyone's eye. Brides and florists have figured out that when bundled together, this filler flower transforms into a delicate, romantic cloud of little white kisses. 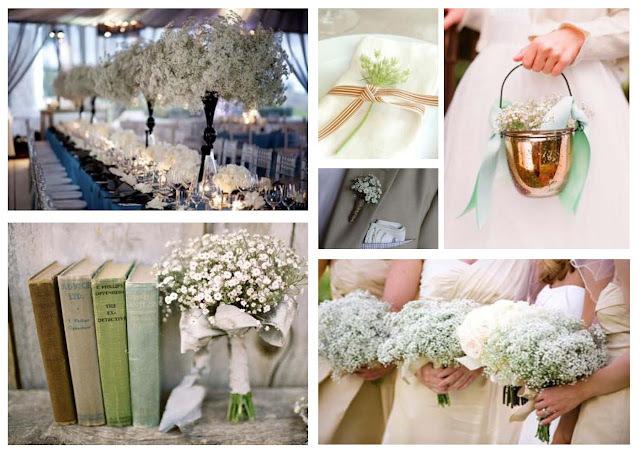 Baby's breath is inexpensive, making it a good choice for a budget wedding decorations and is visually striking when used in large volumes. 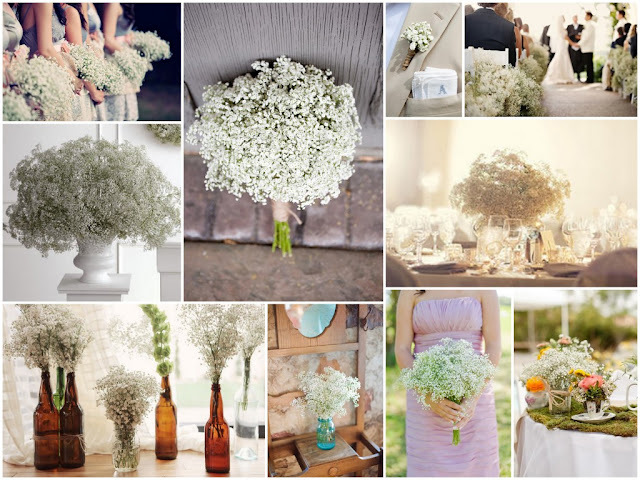 Gathered and used in clusters, the new found appreciation of baby’s breath is a welcomed addition to the modern wedding world. 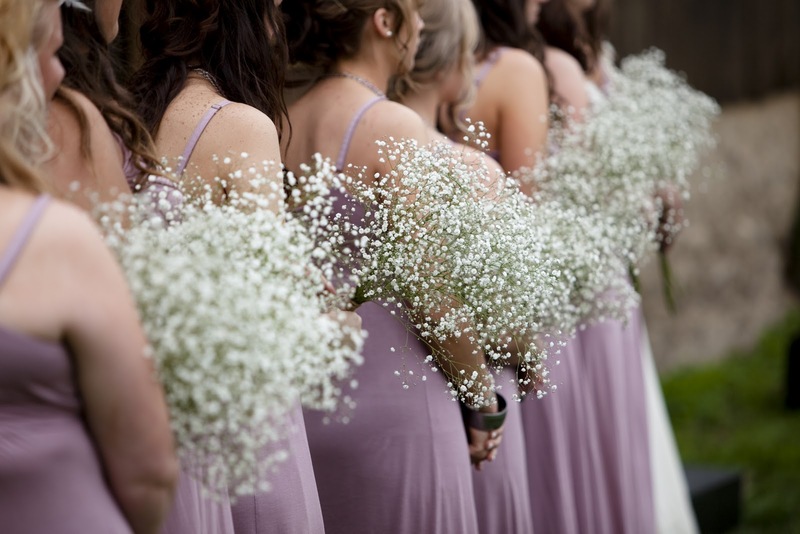 Always confirm with your florist the quality (size) of the baby’s breath as they are most definitely not all created equal! Some blooms are large and full, while others are smaller and more green than white. 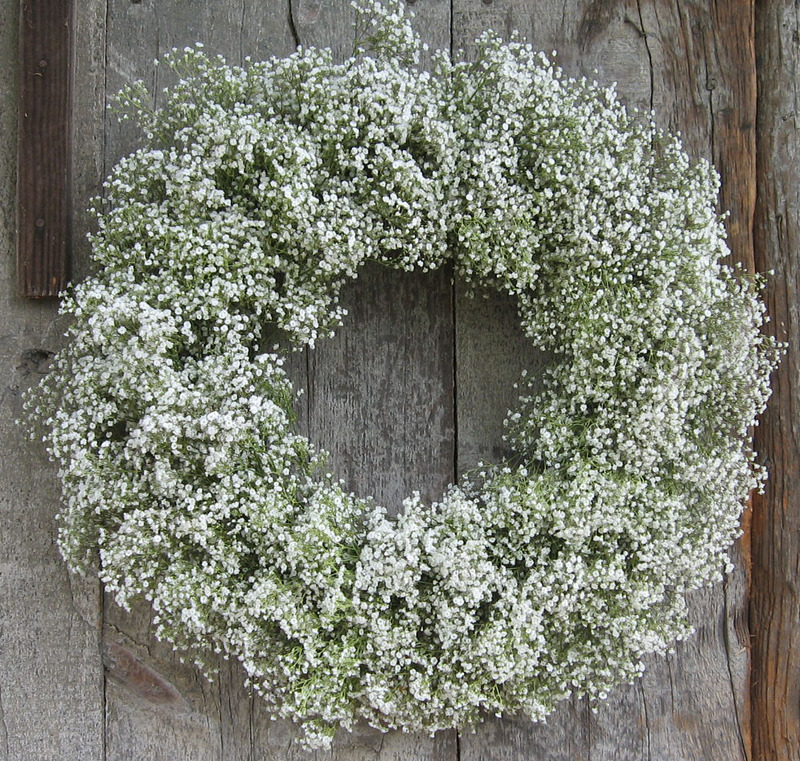 If you’re using Baby’s Breath as a bouquet flower, keep in mind that even though the blooms are light and airy and take up lots of space, the stems themselves are very skinny. Make sure to ask your florist to add in some additional stem pieces to ‘bulk up’ where you’ll be holding. So I take it all back, Baby's Breath is no useless flower; it is delicate, fresh, totally romantic, and best of all a good bang for your buck! 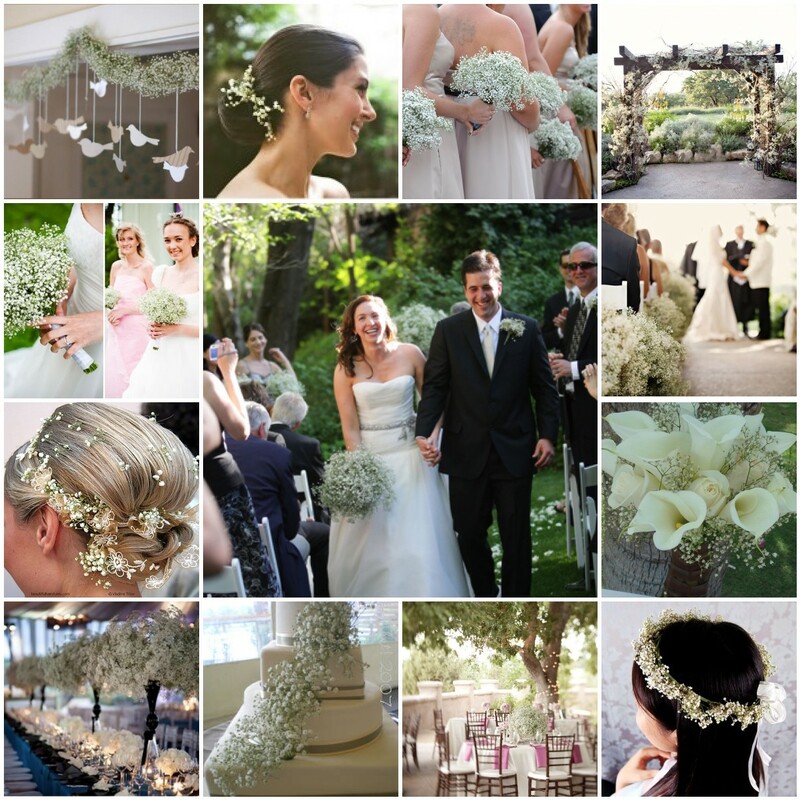 What baby's breath wedding decorations would you consider including in your wedding? Leave us a comment about other under appreciated florals or accents that you think should take their rightful place in the wedding mainstream. Join our Facebook Fanpage, follow us on Twitter and Pinterest! You can also sign up to receive daily inspiration and goodies by your email! That's absolutely lovely and awesome... one more, it's simple and yet beautiful. Becca, glad you enjoyed the post; i hope the ideas were helping in planning an exciting celebration! I think baby's breath is so underrated and can be so elegant when done correctly. Would love to see any of your baby's breath creations! Leave us a comment and let us know what you like! Wedding DIY Round Up: Pinwheels, Flowers and Favors, oh MY! Share your Real Wedding, Engagement Story or Styled Shoot with de Lovely Affair! 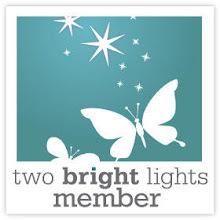 Ideas, Inspirations, & Giveaways right to your inbox! (c) de Lovely Affair 2010. Picture Window theme. Powered by Blogger.